An ancient song repertory lost since the 11th century has been reconstructed by researchers from the University of Cambridge. It’s called “Songs of Consolation,” and it was a medieval musical retelling of Roman philosopher Boethius’s magnum opus, The Consolation of Philosophy. Back then it was common practice to take classic works, such as those written by Horace and Virgil, and assign a melody to the texts. This was done to learn and ritualize the texts, which often consisted of love songs and laments. You can listen to a short excerpt of the recovered work in the above video. The entire thing is well over an hour. The performance is quite dreamy and whimsical, almost like something by the Moody Blues. The Latin lyrics place the work firmly in the Middle Ages, evoking images of monks chanting in their medieval cathedrals. Reconstructing “Consolation” wasn’t easy, and it took many years of hard work. It was put together from neumes—symbols that represented musical notation back in the Middle Ages, and a precursor to modern notation. 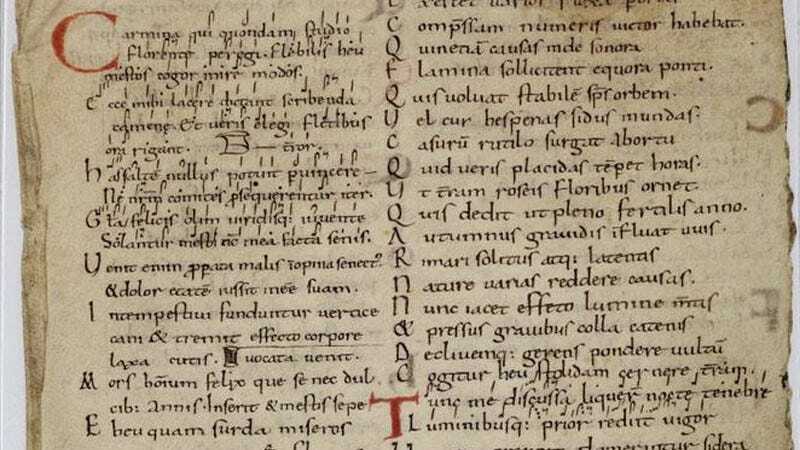 The reconstruction was made possible owing to the re-discovery of an 11th century manuscript that was stolen from Cambridge University and presumed lost for nearly a century and a half. Musicologist Sam Barrett from Cambridge University has spent the last two decades identifying the techniques used to set these verse forms. The recovery of the missing leaf, which had sat idle in a German library since the 1840s, enabled Barrett to go about an actual reconstruction. Working with the recovered leaf, Barrett managed to piece together about 80 to 90 percent of the melody. He then recruited Sequentia—a three-piece ensemble that specializes in medieval music—so that he could hear what the songs actually sounded like, and to refine his initial reconstructive work. This coming Saturday, April 23, Sequentia will be performing “Songs of Consolation” at Pembroke College Chapel at Cambridge University, from 8pm-9:30pm. It’ll be the first live performance of the piece in nearly a thousand years.